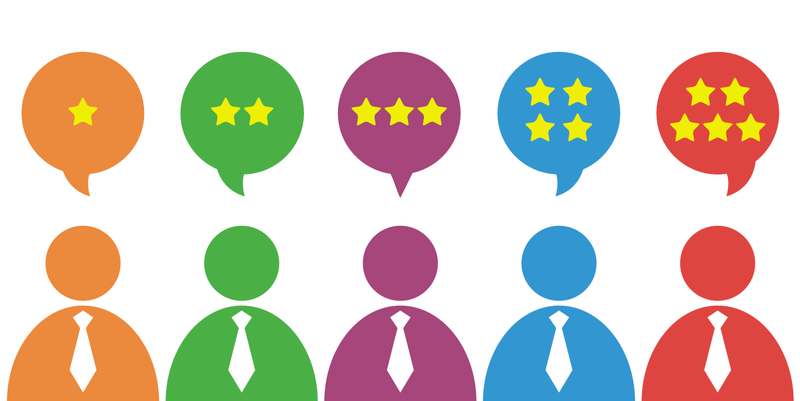 How DO Consumers USE Online Physician Reviews? The truth is we often use them without intending to. 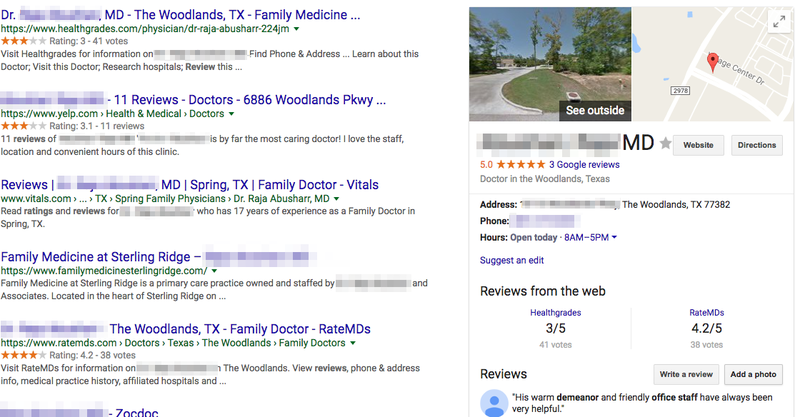 When I searched my general practitioner on Google, the physician's website was fourth in the search results, plus there's a huge box at the right on the desktop to feature him in Google. Many won't even get to his website to see what they have to say before exposure to many different reviews, as you see here. We also naturally tend to gravitate towards sites we know and already trust like Health Grades or Yelp. Both of those beat the practice's own site in search results for this doctor. How Much Do Online Physician Reviews Affect a Patient’s Decision? Bright Local reports that in 2017, among those who look at online reviews, 68% said a positive review makes them trust a business more. And negative reviews have almost as big of an effect in the opposite direction with 40% saying that a negative review makes them not want to use that business. In 2016, the National Research Corporation reported that 47% of consumers indicated that a doctor’s online reputation matters. This percentage is tied with the restaurant industry for #1 among all local business types. The short answer: Physician online reviews matter. A lot. What To Do If Your REviews Aren't all Five-STARS? If every doctor in the practice has a 4 or 5 star rating on all of the various review sites being monitored by your service provider – then rock on! You don't really need to do much other than just keep on doing what you do. It's a very personal feeling when you see someone comment about you and your life's work in a negative way. Remember, your response can actually make things worse if it's not carefully crafted and all facts taken into consideration. You don't want to leave a public record of an argument with anyone on a third party website. Whenever possible we recommend the practice call that patient right away and have the discussion offline. That way when you respond online later to state that you saw this and addressed with Mr. X privately because he is very important to you. You don't want to be accused of trying to manipulate how your reptuation looks by removing anything that's negative. When every review is 5-stars, consumers are likely to sense that you're curating the results to only show the best ones. You can also start a firestorm on social media if you remove a negative review rather than respond to it publicly. Whether you do it yourself or you engage a reputation management service, negative reviews should not be ignored. If you’re starting to see a few comments that aren’t as positive as you’d like, it could be a flag that someone at your practice is not interacting well with patients. Or perhaps there’s a problem with your operational flow that has caused some discontent. These are things that can easily be addressed, improving your patient experience and reducing further harm to your personal reputation! Using a service makes it easier to stay on top of what's out there so that you and your staff aren't blind-sided by a negative review. We recommend that you use a service that monitors everything and gives you a regular report or a dashboard you can access at any time. They can also help mitigate some negative reviews from appearing publicly. Your review service can often help with removal of a review, especially if PHI is being revealed. Ask us if you're not sure what kind of review services are out there and what you get with each. It's not enough to know what's out there, you'll also need hands to help correct things and address items as they come up in reviews. Most of the online review collection services do not review and update the data. They only aggregate it for you. If you don't have someone you can assign to this, let us know. Facebook could also play a role if you have reviews enabled on your business' page. Don't do anything that could potentially look like you're stuffing the reviews. Consumers will become suspicious if they see this. Avoid asking your spouse or children to review you, as well as your employees. You really need actual patients to submit their reviews. Use a follow up email to give them a link for reviews. Some services offer a texting following where reviews can be submitted. We mentioned at the start that other providers are reading the reviews, especially for physicians they may refer to. While your best referral sources typically know you personally, they want to be sure that their patients are going to find good things about you online, knowing that about three-fourths of them will do a check of the reviews. Also, be sure your listings and reviews show the correct office address so that your referral sources feel confident that when they refer you their patients can find you. If you’d like to learn more about how we can help organize a physician's online presence, contact us. You may also be interested in the referral marketing process and how you can use your website to play a role in developing referrals. For that we recommend you download our free eBook.